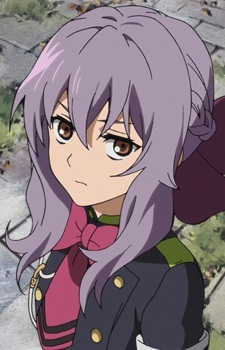 Shinoa Hiiragi is Guren's sergeant and one of the squad leaders of the Moon Demon Company. She is appointed to supervise Yuuichirou during his suspension from the Japanese Imperial Demon Army for his reckless behavior. She is sarcastic and enjoys teasing others, especially Yuuichirou. Despite being a member of the distinguished Hiiragi family, Shinoa is uninterested in their internal power struggle. Moreover, due to her sister's legacy she is generally shunned by the upper echelon of the army. However, she is loyal to Guren and to the members of her squad.